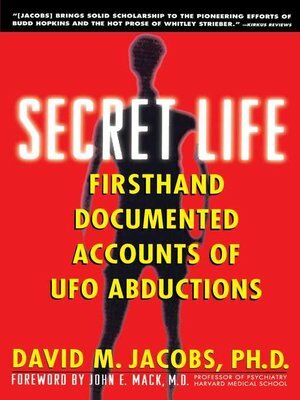 In Secret Life, Professor David M. Jacobs of Temple University takes us into the private world of those abducted by aliens, letting them describe in their own words what it is like to be abducted. Based on interviews with sixty individuals and more than 300 independently corroborated accounts, Secret Life presents the most complete and accurate picture of alien abductions ever compiled. Dr. Jacobs takes the reader on a minute-by-minute journey through a typical abduction experience and describes in detail the bizarre physical, mental and reproductive procedures that abductees claim have been administered by small alien beings. Jacobs draws from these interviews a profoundly unsettling reason behind the abductions: aliens are conducting a complex reproductive experiment involving the conception, gestation. or incubation of human and alien hybrid beings. David M. JacobsDavid M. Jacobs is an Associate Professor of History at Temple University in Philadelphia and a leading authority on unidentified flying objects. He is the author of The UFO Controversy in America. .